If you’ve been paying any amount of attention to the Portland music scene (or, in particular, this site) for the past 6 months or so, then you’ve probably become fairly well-acquainted with the quirky experimental pop duo of Lady Lamb The Beekeeper. They first caught my attention back in November and have only gotten better, more interesting, and way more popular in the time since. One of the cornerstones of the Tower Of Song (including the Festival), they hold down the all-important lead-in to the final set of performances at tomorrow’s Festival, playing at 5pm. What was the most unusual place you’ve ever played music in? What is the most mysterious album you own? A burned CD of some homemade hip-hop that I found on the ground in front of a gas station in Connecticut. Have you ever written a song inspired by a dream? What was the song about? I had wanted to get a separate photo of the other half of the band, TJ Metcalfe, as well, but unfortunately it just didn’t work out. Here are his answers to our questions though! Describe your favorite sound not made by a musical instrument. What do you think happens when you get too far from your house? When I get far away from my house (I haven’t figured out what TOO far means) my stomach moves a lot (whether it sinks out of fright or uncertainty or rises up into my throat out of sheer nervous excitement) . My eyes work overtime, attempting to soak up/in anything different than what my normal surroundings can offer. Also, I start to think that since life is one big game of chance at times, that I could meet my next new close friend / girlfriend / enemy / business partner /muse/ etc. around the next corner of wherever I’m going. Whether for the good or bad, being far away from home is exciting. 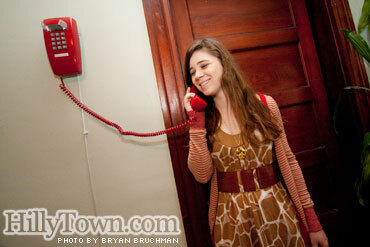 A Red Telephone… hell yes! I had a feeling you’d like that one. Really, I should have gotten you and Alicia with the Red Telephone. Some day.